Lifestyle Delivery Systems Inc. (“LDS”) is a technology and intellectual property company, comprising of Lifestyle Delivery Systems Inc., holding multiple municipal and state licenses which are completely vertically integrated at every level of the California cannabis industry. Other companies make this statement no other company can back this statement up from genetics to the customer’s door step. Even our electrical needs are provided from our own electrical power generation. The Core Isogenic’s cannabis pollination nursery is producing new stronger cannabis generations from seed, resistant to insects, fungus, mold and mildew. PROPRIETARY STATE OF THE ART MULTILEVEL CULTIVATION SYSTEM. THIS CULTIVATION SYSTEM ALLOWS FOR THE ULTIMATE CONTROL OF OUR GENETICS FROM SEED TO HARVEST ENVIRONMENT. OUR ADVANCED ISO-GENTIC SEED TECHNOLOGY WILL SAFELY WITHOUT PESTICIDES, HERBICIDES OR FUNGICIDES INCREASE HARVEST YIELDS.. The CSPA Group Inc. with multiple licenses for extraction, manufacturing, packaging, transportation and distribution has ultimate control over our products. Producing our flagship product CannaStrips™, the true sublingual, nano particulate, stealth encapsulated delivery system with bioavailability studies to confirm its effectiveness. Being able to control every aspect of the cannabis plant from the genetic ingredients to its incorporation into cannabis products allows LDS to cultivate, manufacture and distribute products at the lowest possible cost in the market, WE HAVE NO THIRD PARTY MARGINS TO PAY, WE CONTROL EVERY FINANCIAL AND OPERATIONAL STEP FROM SEED TO SALE.. These complex formulations and ground breaking products are possible only because we have built a pharmaceutically capable laboratory in our facility. Backed with science we will continue to innovate technology in order to push the boundaries of what the cannabis plant can offer to our customers. The Highway 395 Dispensary and Delivery will complete the final step. Located on one of the busiest highways in California this dispensary will have OVER 120,000 VEHICLES PASSING THE 395 DISPENSARY LOCATION DAILY and a geographic delivery area of over 25 million residents and over 150 million annual visitors. This term vertical integration has become a buzz word in the cannabis industry and it is most often an exaggeration when discussing any other company in the cannabis sector. A solution was necessary to resolve cannabis genetics riddled with pesticides in the DNA. Yes according to cannabis industry observers 80-90% of all clones have pesticide in the DNA. You have to start with the best raw material to produce the best products. Lifestyle Delivery Systems (LDS) in the truest sense of the description has the safest Vertically Integrated Market Solution. The company’s vertically integrated scientific approach to controlling every aspect of the supply chain from pure genetics (DNA pesticide free), seeds, seedlings, cultivation, extraction, distillation and manufacturing stands alone in the cannabis industry. LDS controls its transportation, distribution, dispensary and direct delivery, making it not only the most complete vertical integration in the cannabis sector, but the safest. In the 3rd quarter of 2019 LDS will have eliminated every middleman mistake and cost margin in its market. The result will be increased margins at every level of production and distribution with net profits increasing up to 200%. In a market sector full of uncertainty LDS will control its variables and its profitability. The benefit to its supply chain is superior clean genetics, ultimate cost controls and total control over products from genetics to the customer “no third party surprises”, “no third party mistakes” and “no third party excuses”. With customer service that would be impossible to replicate without our fully integrated market solution producing superior products. This state of the art genetics nursery has the capability to supply up to 60 contracted cultivations to grow our seedlings (not clones) into mature, ready-to-harvest cannabis plants with precise genetics for extraction and distillation, which will be used to produce CannaStrips™ formulations. Additional revenue will be generated from the sale of seedlings to cultivators. Controlling our supply chain from seed to cultivation, extraction, distillation, formulation, manufacturing, and packaging of cannabis products will allow us to ensure the highest quality ingredients used for every product we produce. The entire environment is circulated through almost 300 feet of ultraviolet light every 3 minutes significantly reducing the chance of contamination in the grow . We control the environment from purification of our water to each individual plant being monitored for all of its nutritional, water, temperature and pH needs. The entire cultivation facility is operated and monitored from a 100 gigabyte computer control center. The data storage is capable of ten years of cultivation history. We can revisit all areas of the cultivation life of any plant that has been germinated from our facility. Our extraction permits allow for CannaStrips™ production and the production on behalf of third parties for white label products such as extracts for edibles (i.e. brownies, chocolates, cookies), drops, vaping cartridges, sprays, and topical ointments. Most cannabis products require cannabis extracts (oils) or distillate, which LDS can supply. 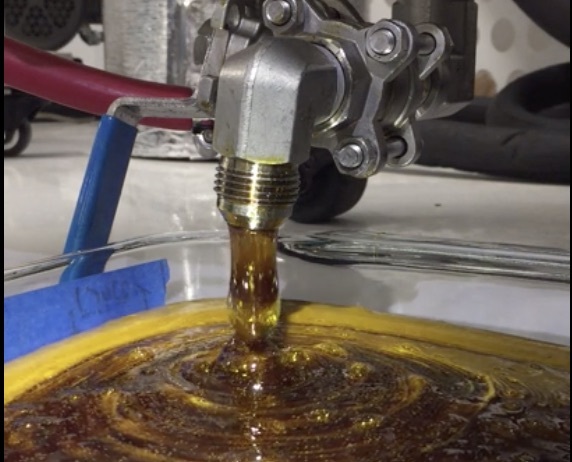 This is expected to create an enormous industry demand across the state of California as the need for high quality extracted cannabis oil increases with a price as high as $10,000 per liter. Distillation will generate high margin revenues throughout the upcoming fiscal year of 2019. This Cash Flow Per Sq. Ft. ratio value is 1 million dollars per 100 square feet ($1 million per 30.5 sq. meters) annually. This is higher than any other industry in the world, making this revenue model extremely attractive. The production equipment is constructed from pharmaceutical grade stainless steel and built to FDA specifications. At a 40% run rate, the equipment has the capacity to produce 500,000 CannaStrips™ per day. The packaging equipment is also constructed from pharmaceutical grade stainless steel and produces individually sealed, water resistant, shelf stable, pharmaceutical grade and FDA child proof compliant packaging. The packaging equipment will meet our production capacity and will produce 500,000 packaged CannaStrips™ per day. Planning, management, and movement of products by road with our fleet of vans and distribution by way of our dispensary is just another way we have an added advantage over competitors. •The brick and mortar dispensary will be the flagship for CannaStrips™ and Rêveur’s promotional point of sale direct delivery. •Highway 395 Dispensary is with in 100 meters and clearly visible from the famous California Highway 395. •The 870 kilometers of the Highway 395 connects the eastern half of Northern and Southern California. •Over 120,000 vehicles will pass the dispensary per day. •The 420 prime Delivery Service as part of the Highway 395 Dispensary will be able to receive online orders for cannabis products and deliver them directly to the customers home or place of business. •The direct delivery ability removing the middle men from between the manufacture and the customer will increase profit margins up to 200%. LDS Agrotech provides clients with a full spectrum of services, including assistance with real estate purchase(s), tenant improvements, equipment acquisition, municipal licensing procedures and cutting-edge cultivation techniques. This Company began as a development project to create a safe and predictable cannabis delivery system for juvenile cancer patients. The foundation of our goal is and has always been to develop a product that was contaminate free, pharmaceutical grade with exact ingredients, precise dosage in a rapid delivery system affordable to everyone. We have accomplished this piece of our goal with CannaStrips™. What remains will be accomplished in 2019 as we complete our final piece of this project. The finish line is the customer’s doorstep, we will delivery our products to the customer by direct delivery at a price without middlemen so affordable that only a fully integrated company like Lifestyle Delivery Systems would be capable of. Currently there is no other company that has accomplished the goal of controlling the genetics to doorstep. Don't be shy. Let's be in touch if you have questions or would like more information about our company.